Bilmillahir Rahmanir Rahim. 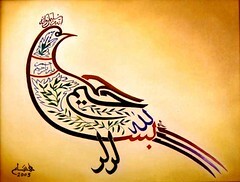 Meaning in the Name of the Most Merciful and Compassionate God. Al-Sadiq said: The letter ba' [of the bismilllah] is the glory of God (baha' allah), the sin ("s"), is the splendour of God (sana' allah), and the mim ("m") is the sovereignty of God, mulk Allah). Allah is the God of all things. al-Rahman pertains to creation in general while al-Rahim specifically applies to the believers.